First the gin, then the tonic. Oisín Davis is one of the leading lights of the cocktail business in Ireland. I bumped into him at the Ballymaloe Litfest, and for the first time I can remember, he had a soft drink in his hand. The liquid in question was Poacher’s Tonic, Ireland’s first tonic water. All of these new Irish gins obviously need something to mix with, and Davis thinks he has the answer. Until now, you could only buy an Irish-made tonic syrup from americanvillage.com. Fever-Tree and other premium tonic waters have been hugely successful in the UK, so it was only a matter of time before someone came up with an Irish version. The Poacher’s Tonic certainly went down well at the Litfest – supplies ran out the first evening, and an emergency dash had to be made back to the warehouse. It is made by Davis and partner Vaughan Yates from spring water drawn from Litterberg House in Co Wexford and bottled in nearby Enniscorthy. “We wanted to make is as Irish as we could,” says Davis. “We got 150 kilos of Irish rosemary and shipped it to a perfumer in the UK, who extracted the rosemary essence. We use cinchona bark to make a natural quinine and add Florida orange and sugar beet for sweetness. It was a year in the making with all sorts of complications and experiments.” According to Davis, Poacher’s pairs best with gins that don’t have too much spicy coriander and cumin, and is less sweet than standard tonics. Gerry Scullion of The Chocolate Factory has come up with his own very unique tonic water. “I make it from scratch using cinchona bark and other spices and a small amount of Irish lavender. It is also a water kefir, and far less sweet than the standard tonic (2 calories a bottle). I create the fizz by the addition of organic honey and bottle-condition for approximately two weeks.” The result is a quite delicious adult tonic, great by itself or with gin. I received another bottle of Irish gin just after going to press with my last article. 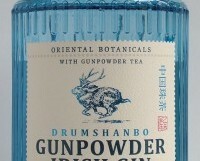 Drumshanbo Gunpowder Irish Gin is the latest creation of Pat Rigney, the man who came up with Boru vodka and Sheridan’s Irish Cream Liqueur. Made in his new distillery in Drumshanbo, it is aimed primarily at the export market, but already has good distribution here in Ireland. If you fancy trying out anIrish G&T, the Irish Gin & Tonic Fest runs from June 20th-25th, where pubs, restaurants and hotels will be serving one or more of eight Irish gins with a tonic of their choice. See greatirishbeverages.com for further details. A very different gin with a distinctive spiciness and refreshing herbs alongside the juniper. Stockists: Widely available including Dunnes, O’Briens, Mulloy’s, select SuperValu. Light and refreshing, with lovely subtle hints of rosemary. Great with or without the gin. Stockists: Drinkstore, D7; Gibneys, Searsons; Donnybrook Fair; Bradleys. A beautifully refreshing dry tonic with a subtle herby touch. Stockists; Whelehan’s; The Chocolate Factory,D1; The Drinkstore, D7; L Mulligan Grocer.